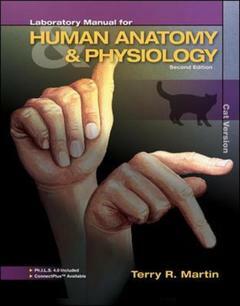 Laboratory manual for human a&p MARTIN Terry R.
Auteur : MARTIN Terry R.
Terry Martin, author of the best-selling laboratory manuals to accompany the Hole's Human Anatomy Physiology texts, has written a new stand alone laboratory manual. This series of laboratory manuals (main - no dissection, cat dissection, fetal pig dissection, and rat dissection) will incorporate Terry's clear, concise writing style. They are not associated with any one text so can be used with any anatomy and physiology text. The artwork and photos will be second to none. It will also come with Ph.I.L.S. 4.0.